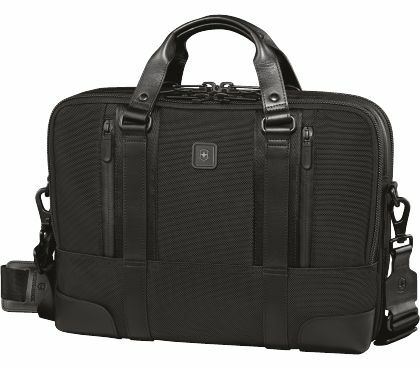 Laptop, tablet, smartphone, adapters, chargers, USB stick – the modern leather briefcase has essentially become a true multimedia bag. We do business anywhere and everywhere nowadays – on planes and trains, in co-working spaces or in cafes, so now more than ever you constantly need all your devices and documents at your fingertips. 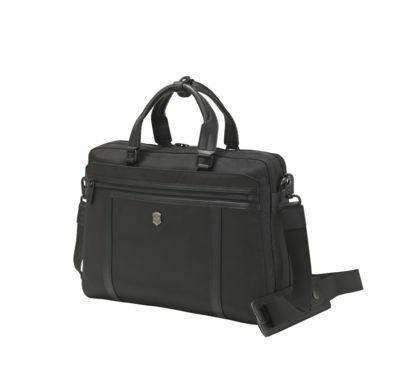 A Victorinox briefcase is a sound investment in a reliable business partner. No matter what size or features you are looking for, the Victorinox leather briefcase is without exception a high-performance, high-capacity all-rounder. 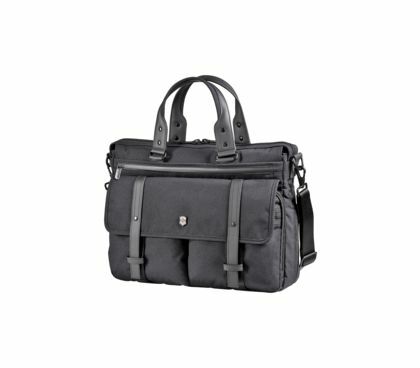 Well-organised and durable under pressure, the Victorinox range of stylish laptop bags and briefcases help you manage every situation and look professional every time. Leave the clutter behind with our meticulous attention to detail. What this means in practice is based on how many features are packed into a briefcase and how this will help energise your professional development – the key points are all summarised for you below. 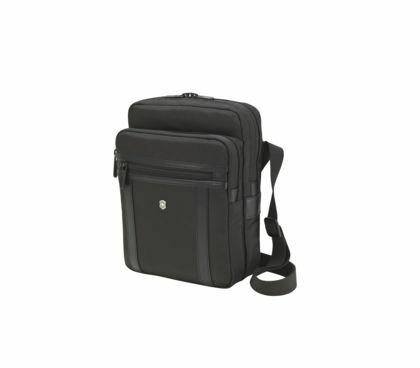 Smart organisational structure: Laptop compartment, mesh pockets, elastic loops, zipped back storage slot, separate outside pockets, every detail in these Swiss briefcases are carefully thought out from A to Z, so that your business gear is well-organised, safely stored, and accessible at any time. 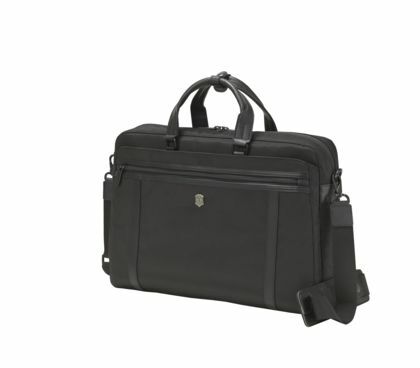 Whether it’s 13", 14", or 15", Victorinox has the perfect briefcase for every format. 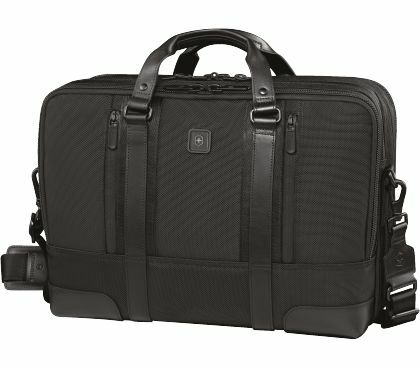 For extra safety and convenience on the road, we offer our Swiss-engineered, shock-absorbing laptop protection system made of Lanidur fabric for our Victorinox LaSalle, Lexington, Shenton, and Century briefcase models. Shoulder straps and handles: Today, flexibility is everything and this applies both to the globetrotting businessman and the bag by his side. Whether over the shoulder or hand carried, comfort should never be compromised and no briefcase should ever be seen as an unwelcome burden. If your new leather briefcase is going to pass the daily-use test, the handles need to fit snugly in your hand, so they can’t be too big or too small. By definition, shoulder straps must offer the most comfortable carry plus adjustability, and every single Victorinox briefcase passes this test with flying colours: with a durable finish and comfortable padding, our shoulder straps are easily adjustable and can be removed as required. Seams and zippers: With any high-quality bag, you can immediately determine the quality by inspecting the seams and zips. Plastic components, simple lock stitches, and loose threads are telltale signs of poor quality, the impact of which should not be underestimated. 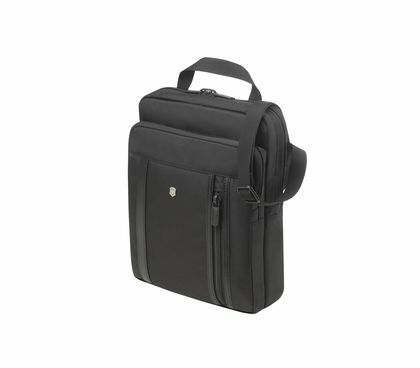 Water-resistant zips are a positive sign; if this is one of the features on your priority list, you will appreciate the quality materials used in the Victorinox LaSalle, Victorinox Lexington, Victorinox Shenton, and Victorinox Century briefcase models. 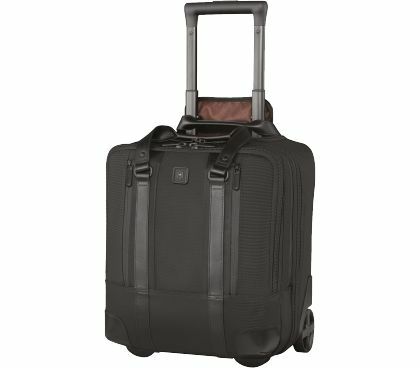 Removable organiser: Victorinox has designed a removable organiser specifically for those travellers who take more than one bag on the road. This helps you keep key accessories like chargers, cables, USB sticks, etc. safely together in one place so they don’t get lost in a chaos of cables. With a tri-fold design that can also be rolled up, it’s extremely practical and can even fit into a flat portfolio. 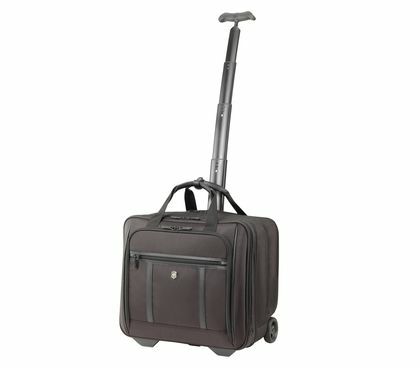 Bag or upright: When your briefcase is also wheeled luggage, this design offers special benefits. Think: large. 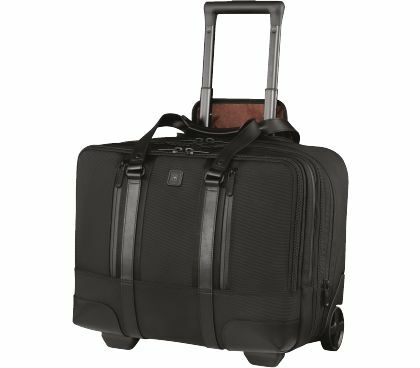 Victorinox Shenton, Victorinox Century, and Victorinox Werks Professional all set new standards for professional travel gear and bring substantial volume to the table, ranging from 25 to 35 litres. 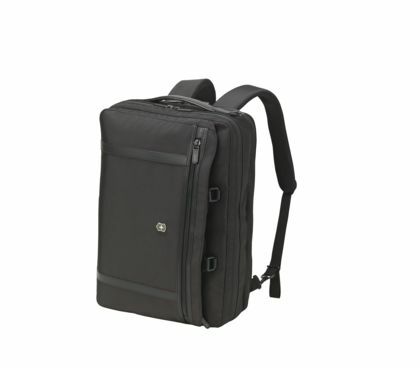 We have also come up with stylish laptop bags featuring a dual-carry system; they can either be carried conventionally or worn as a full backpack. Ladies and Gentlemen: First things first – black is the colour of choice, irrespective of gender, followed in second place by brown. We’ll be the first to admit that for style aficionados or minimalists, the classic leather briefcase will always be top of the list. In comparison, the modern multi-taskers made of lightweight, durable, and dirt-repellent high-tech materials offer a higher level of comfort, especially when travelling. 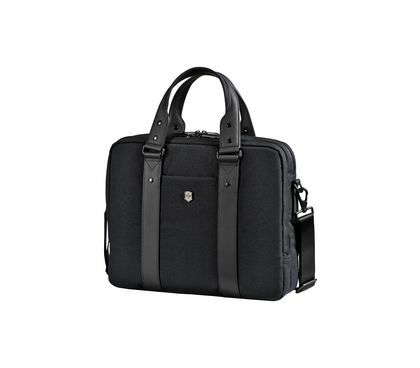 Our conclusion: a briefcase for day-to-day use and a briefcase for travelling. The former has an elegant look, the latter a more casual one – an appealing compromise that is well worth thinking about.